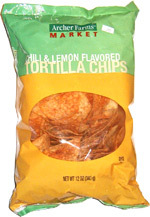 Taste test: These have a strong-on-the-tongue taste at first, you can kind of taste the hint of lemon and kind of a chili taste before the corn tortilla taste takes over. I can see how you would want to eat these as an accessory to another meal (either chili or a sandwich), I don't think these are strong enough to eat just by themselves. Smell test: A taco-powder type of smell. This snack was discovered by Keith at Target. Review published .